Whether you’re looking to buy, sell or get a loan on your items of value, Best Collateral always provides excellent customer service and a great experience. With eight locations in the Northern California, Best Collateral pawn shops offer collateral loans, cash for gold and retail shopping in a friendly, inviting environment that keeps our customers coming back often. Our team of expert appraisers and specialists are ready and eager to meet your buy, sell, loan needs. BUY – Do you like to shop? At Best Collateral, you can always find what you’re looking for at a price you’ll love. Why buy from one of those high priced retailers? Best Collateral sells quality, new and pre-owned merchandise priced below retail and even wholesale. We invite you to stop by and see our wide selection of diamond and gold jewelry, high end watches, collectibles, appliances, musical instruments, and more. Best Collateral is where luxury is made affordable. SELL – Everyone has unused or unwanted items taking up space at home, such as gold and diamond jewelry, electronics or musical instruments. Don’t ship your precious jewelry off in an envelope to some unknown cash for gold dealer. 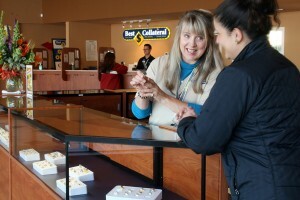 Sell your gold or other items of value locally at Best Collateral. Our expert appraisers and GIA Certified Accredited Jewelry Professionals evaluate your items quickly and pay you more cash. LOAN – Do you need cash now to pay an unexpected bill, make your company payroll, help close a business deal or just help you get to your next paycheck? A pawn loan from Best Collateral maybe your solution. The process of getting a loan is easy. A pawn loan, or a collateral loan, is based on an item of value. Pawn loans are convenient, easy and never affect your credit. With Best Collateral, you’ll have over four months to pay your loan. A pawn loan often costs less than a bounced check or late bill fee. At the end of the period, if you’re not in a position to pay back the loan, no problem. You may either just pay the interest and get four more months to pay off the loan, or you can just go about your business and have no further obligation to Best Collateral. Either way, we will not make a report to any credit agency. Get more when you buy, sell or loan with our new Customer Rewards Program. At Best Collateral, you earn redeemable points on all of your transactions, whether you buy something from us, sell something to us or enter into a loan with us. All of these activities earn points towards thousands of merchandise options, like flat screen TVs, tools, video games, consoles and gift certificates. Best Collateral is the only pawn shop where you choose from new merchandise when you redeem your points. So, if you need to buy, sell or loan, come into Best Collateral where we reward you for all the business you do with us.